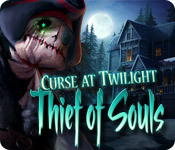 Curse at Twilight: Thief of Souls is rated 4.1 out of 5 by 109. Rated 5 out of 5 by SparkleGlow100 from GORGEOUS ARTWORK IN TONS OF PLACES - RELAXING. Need more games like this one please! (Available at BFG since 2012) This is not your action-packed game of 2016 with endless cut-scenes. This is a nature-filled quest, with great artwork. You will get to venture to 4 different lands to obtain various items to complete a search for a special ring that will remove a curse. If you play on Expert, you'll be glad that there are zero sparkles, although you will get some verbal clues if you use a hint, and a circling of an item in the scene. STORY - 1. Stunning coastal waters/lake, with castle 2. Mesmerizing woodland cottage with vegetable patch, cow and chickens and stream (loved this, and wanted to live here), 3) a town 4) lost gardens with cave, waterfall and cemetary. Of course, I liked 1. 2. and 4. best. GRAPHICS - Stunning in places. Disney-like in some places, and at other times like a painting, but a mix in general. Only Full Screen or windowed (not wide). Option to adjust BRIGHTNESS. Some of the fragmented objects to collect are pretty blended in, and I had to get closer to the screen momentarily, so I wouldn't recommend this game for anyone with eye struggles. HOPS - i) FRAGMENTED OBJECTS - 15 or more - where an object fragments across the entire scene. ii) 5 or 6 typical wordlist HOPS. iii) GOLD COINS ( 3 - 4) must be collected from each scene. A tally, middle-top of screen, shows how many you must find and how many are left. You MUST find them. If you don't hints will be used for this purpose too. PUZZLES: A handful. All skippable. About 2 puzzles didn't seem to work for me. SOUNDS -2 : Music & Sound. Music is suitable and totally separate. The sound is everything else unfortunately. I did find the mouse-click action effects a bit loud in comparison to the ambient sounds. But overrall ambience was ok. MAP: YES - TRAVEL. Interestingly, one of the coins you select in the scene activates the ability to travel to this scene. Didn't see any map indicators. But I played on Expert, so maybe there were on Casual. JOURNAL: NONE, but the number of tasks for each scene are listed at the top of the screen. DIFFICULTY SETTINGS - 2- Casual / Hard. NOT interchangeable. HINT: 40 seconds to recharge on Casual, and longer on Expert. I played on Expert, so not sure how much leading you get on Casual. There IS a WALKTHOUGH AVAILABLE FROM BFG. INVENTORY - Visible AT ALL TIMES. CHARACTERS: Minimal interaction. Appropriate voices when they occur. Not big on characters or character action. Rated 5 out of 5 by PoohFan2 from Absolutely loved this game! 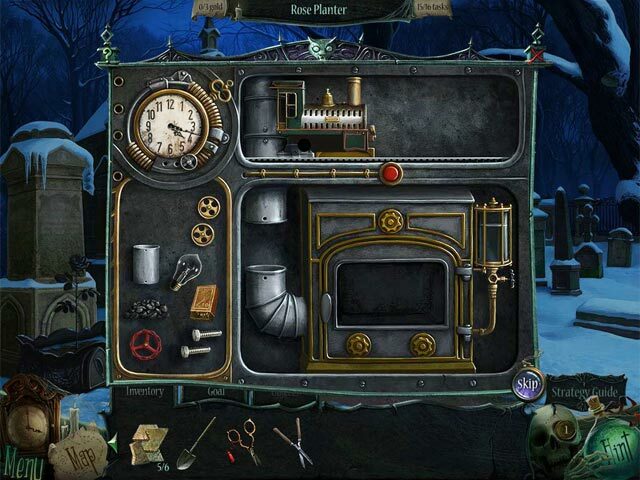 This game provided many new puzzles and ho games. Kept me not wanting to leave the game because I was having too much fun. Hope they put out more games like this one!!! Rated 5 out of 5 by p2668 from Really Great Game!! Now this is my type of game. I don't know why I enjoyed it so much, but it kept my interest right until the end. The music was really appropriate for the setting, and that has a lot to do with the creepiness that I really enjoy. I also thought it was clever that the tasks had counters at the top of the page so you knew if you were done with that scene or not. Also, with the gold coins you had to collect. Some collection games don't even have that many extras. Didn't need the map, as it was easy to find your way around. Lots of clever and different puzzles to complete, and other tasks that kept you from getting bored. Would like to see more games like this one. I really enjoyed it. Rated 5 out of 5 by Rowel89 from Interesting game This game definetely worth money you pay for it. Joyful graphics and storyline. Sadly playing it a bit too easy with tips it has. But still i enjoyed alot. Rated 5 out of 5 by Boomer1097 from Enjoyable Game This game was fun! There are plenty of things to do...collect coins in each scene to build the map, complete iHOS, find an item or two in each scene that must be assembled by locating pieces of the item in the scene, playing the mini games, talking to characters to fill in the back story, complete your list of objectives/goals and complete all the tasks so you can destroy the evil presence in the house. The graphics are pretty well done. You can also adjust the brightness of the game, which comes in handy in some scenes. The music is okay. The mini games are fun, some of the iHOSs are hard (which was fun) and the various items you have to assemble was entertaining. The ending was very satisfying. I recommend this game. 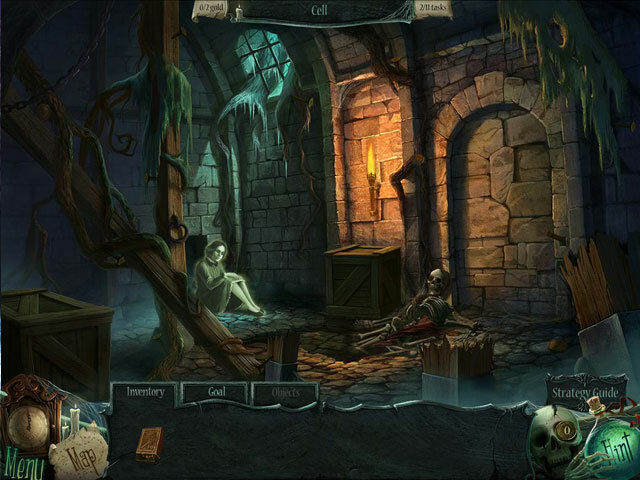 Rated 5 out of 5 by pennmom36 from Curse at Twilight: Thief of Souls This little gem snuck past my radar! You have been invited to that familiar manor down the street known as the Darkfall Manor, you weren't aware that anyone had purchased this old manor let alone renovated it so naturally your curiosity gets the best of you.....what a mistake this would turn out to be, mistake or destiny? The manor is definitely haunted and destiny has sent you here to make things right, There are all kinds of cool features with this game. To start with, your inventory bar can easily be toggled between your goals, your inventory items and the objects you need to find. 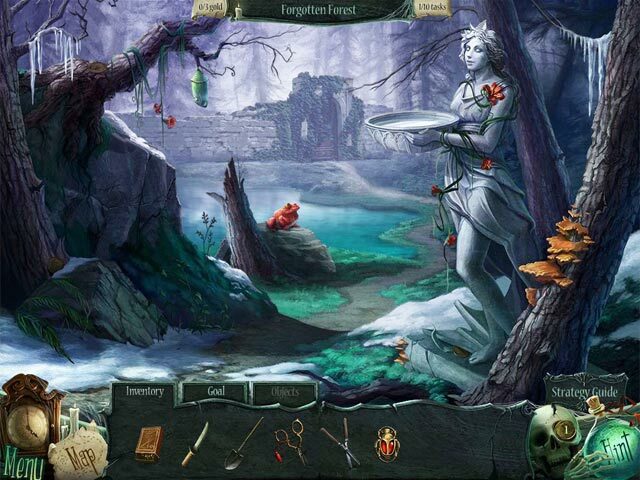 The objects aren't the hidden object scene items, but just about every scene has a broken item such as an axe, or bell, and you need to find all of the fragmented pieces as shown on the objects tab in order to restore that item. You will also have a tab at the top of the screen that show the number of tasks as well as how many tasks have been completed and another tab shows how many gold coins have been collected and what the total amount of coins in that scene should be found. You need to find all coins in that scene in order to earn that scene's picture on the map and gain hints! There are also HOS but not that many and in my opinion the need is fulfilled with the fragmented objects. There are mini games as well such as following directions to turn on the electric panel, selecting the correct colors on an owl and even puzzle swaps with rotating pieces. Don't let this game slip past your radar, it's is well worth your time. I'm going to play the Collectors Edition to see what exciting features are in that game, what could possibly top this one? Enjoy! Rated 5 out of 5 by LEIZAP from Great Game! Fun game full of interactive HO's, puzzles, adventure play, and hidden coins that are actually useful! Loved every minute of it!!! Rated 5 out of 5 by mcgillican from Unexpected fun This is based on only 1/2 of the demo time and I already liked this game! I read so many reviews (good and bad) and decided to try it. It will be part of my growing collection for sure! Sound and graphics are great. I love being able to brighten scenes in options! My old eyes need that help. A definite plus on this one. Like the search for fragments of puzzles, and the search for the coins to create the map as you go. Then it is an interactive map on top of it all - wonderful! I do miss a proper journal, but that is probably just because most other HOPA have them. Map is far more important. The music is repititious yet appropriate to create the atmosphere. The hint button is useful. Glad I tried this one! Thank you reviewers! It convinced me to check this one out.